Hellow Guys, this week I begin this tutorial in Actionscript 3 for total beginners and it shall be very simple. 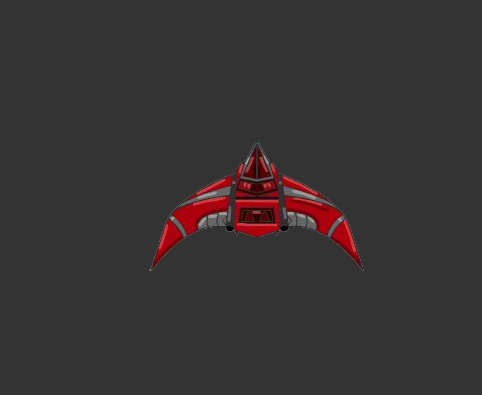 What we will develop here shall be something like We did before in Cocos2d Objective C tutorial, a spaceship shooting others spaceships. I will be using Adobe Flash Professional CS6, but if you are familiar with Flash CC or Air Project you can easily adapt to both of them. The tutorial will be really simple, and is for Newbies that never see a Flash CS6 before, a real step-to-step and will abort since the ship movement till the publication to the Play Store or App Store. Well Let’s begin. -First of All: Open your Flash Professional and select AIR for Android. “Oh but I want to publish for my iPad”, don’t worry, you can change it later. -Choose the template 800 x 480 Blank and push “OK”. Now we have a great white screen project and here is where we can start to work. First of all we are gonna create the class for our project. 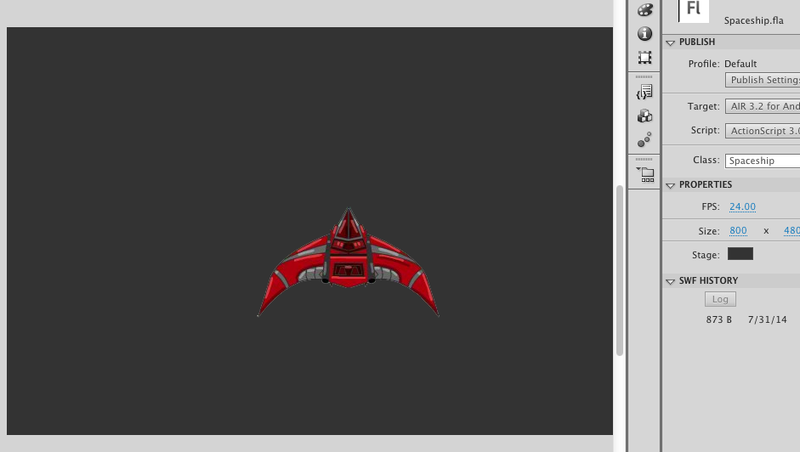 -In Class type “Spaceship and click on the pencil at the right side of the textbox”. -Click over the pencil again and you may select Flash Professional or Flash Builder to edit your ActionScript 3 class, pick the best for you. *This trace is something like the “System.out.println” from java or “System.Diagnostics.Debug.Write” from C#, it shall print in Output and not in the screen. -Now let’s test our Document, back to your Flash CS6 Document, your Spaceship.fla and go to “Control”->”Test Movie”->”in Air debug Launcher via Desktop”. If you want to test something now in your own Android Device and you are using Flash CS6, you certainly will need to upgrade your Air for Android to 4.0 or later, here in the Screenshots you can see Air 3.2 for Android and it won’t work in early upgraded devices. if in Output you can read “inited”, that means everything till now you did right and your Class is linked to your Flash Document and we are ready to start to work. I created it, so we won’t have any problem to use this ship. A pop up “Preparing to import” shall comes to your screen. 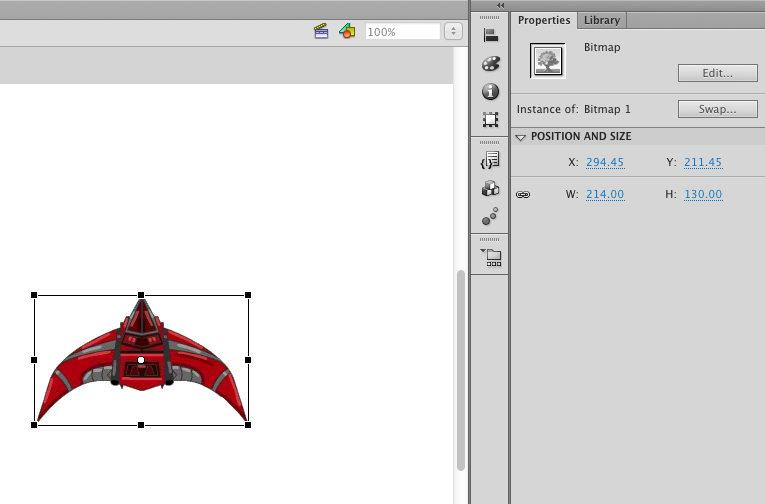 Now you have a Spaceship Bitmap in your flash document. -Let’s change the stage color to see it appropriately. 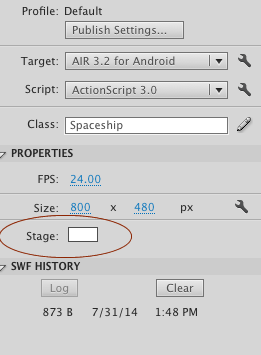 Click in the stage (the big white part of our document, this way we can see the Properties of the stage and not from the Spaceship. Change the Stage color from white to Dark Grey. 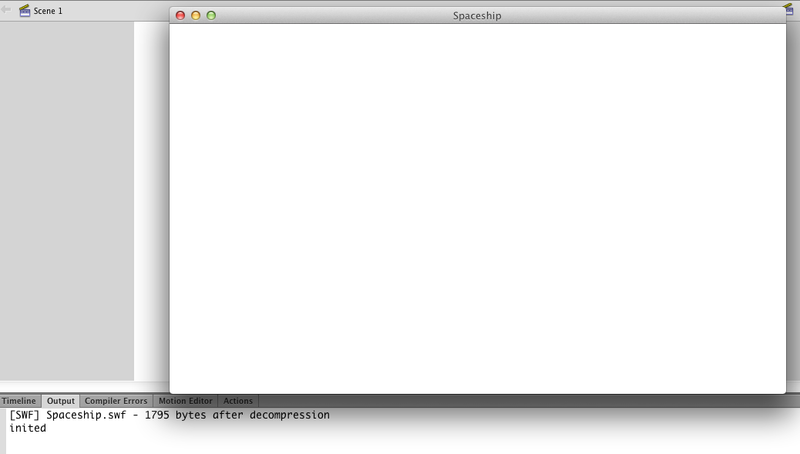 Now we need to Convert this Spaceship to a Simbol. -Click over “Modify->Convert to Simbol” or just hit F8. 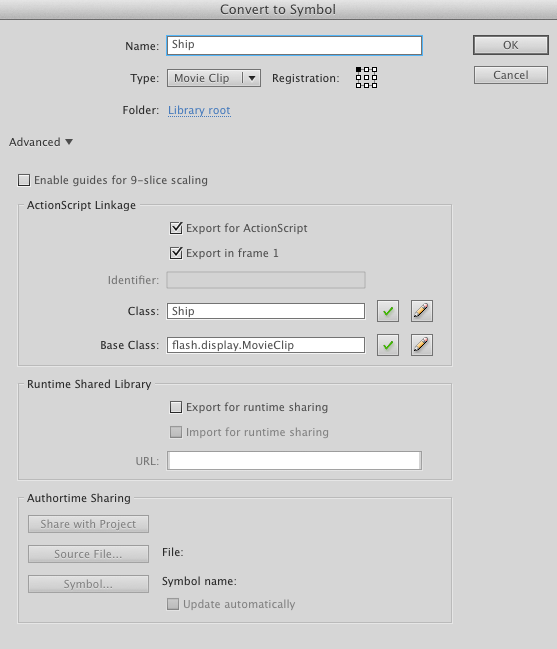 In Advanced check “Export for Actionscript” -> So we can have a class over it. 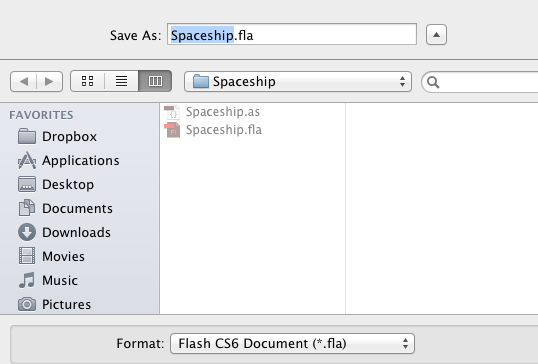 Class: Ship -> The first letter shall be in caption and it won’t be Spaceship so it wont conflict with the Document’s actionscript file. Base Class: flash.display.MovieClip -> the library where will be extended our class. 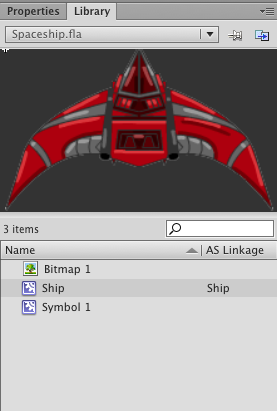 Now in the library we will have a Ship with AS Linkage “Ship”. In true for now I don’t plan to use the Ship.as, we won’t need it. 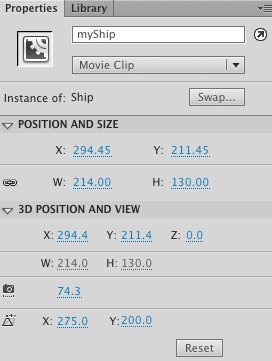 So click over the Ship again and check the Properties. And well, time to move it. The next tutorial is on, click HERE TO READ. Previous Previous post: Good News! When My Cat Fall and new Tutorials!